Inspired by the medieval wall painting of the legend of Saint Eustace at Canterbury Cathedral, and utilizing a made-up language filled with double meanings and puns, Russell Hoban’s 1981 story of a newly come of age boy in a post-nuclear England is widely admired by readers, critics, and authors. Gather round and share your experiences reading this especially striking apocalyptic tale! There is a lot online that is easily googled about both Hoban and Riddley. Hoban wrote some beloved children’s books (Bread and Jam for Frances) and some somewhat lesser known genre-bending adult books - Riddley Walker is undoubtedly the most famous. An American who lived most of his adult life in England, he seemed to write mostly from an English point of view, and Riddley centrally features England's specific geography. There are endless links about the book and Hoban at the end of this page, including interviews with Hoban. Here we find a long set of annotations. (I found the notes on places especially helpful.) This article is, well, pedantic as all get out, but it did help explain some stuff about the plot that I hadn’t been able to follow, and also attempts to break down the 'rules' of Riddley Speak. Hoban does an exceptionally good job putting the reader into Riddley’s world. The language is a lot of it, but we never see more of the story than Riddley can see. As a result, there were chunks of the book where I knew something was happening, but I couldn’t 100% follow what the significance of that something was. Often I read a book and think, “this is a good writer” or “this is a not so good writer”, but with this book, I felt I wasn’t quite a strong enough reader to really get all I could out of it. Raise your hand if you actually followed the plot? The plot question is an interesting one because I think I had this idea reading it that this was sort of a pivotal moment in this culture, but I actually think the story is sort of smaller-scale than that. One thing that confused me stupidly for a while in that vein... the yellow stuff that they get from the dead guy on the boat. I kept trying to figure out how it could be uranium, like "yellowcake" uranium, but it was just sulphur. I read this book earlier this year (prior to books launching here on fanfare) and it's such a complete delight. I think it's the best ever use of vernacular I've encountered. It functions as perfect non-lore-dump worldbuilding, but also as a really engaging puzzle for the reader that draws you further into the book. It forces you to engage the entire thing on Riddley's level, which is a challenge but ultimately really exciting. Also, I think that using a sort of post-technological viewpoint to engage with the idea of nuclear technology is really compelling. Obviously there have been a lot of post-nuclear novels, but here you get a sense of the kind of "this is deadly and also totally beyond me" quasi-religious terror that I felt as a kid (and even now) thinking about nukes. Now I'd really like to go back and re-read A Canticle for Leibovitz. I'm about halfway through this and I can't believe I'd never heard of it before. I am strongly reminded of Jasper Fforde's PA book Shades of Grey, which also has a strong sense of place and is set in a specific area of Great Britain. I'll chime in with more later but first this helpful hint: If you're stuck, try reading it aloud. Russell Hoban is up there with Vonnegut in my all time faves. I was a huge fan of the Mouse and His Child when much younger, and fell deeper under his spell when I came across The Lion of Boaz-Jachin and Jachin-Boaz. This led me to acquire, when confronted with them in obscure bookshops, Pilgermann, My Tango with Barbara Strozzi, and especially The Medusa Frequency, which inspires me to this day. The fact that there are still books of his I have yet to read fills me with delight, and the fact that I have never hunted down his books but they have arrived in my life at appropriate times is somewhat magical. Riddley Walker is, of course, a classic. But I read it (OMG) twenty years ago and I only have the broadest of outlines of it in my head, and I don't actually own a copy! So I'll just have to leave my commentary as "Russell Hoban! Yay! Read more of his stuff - you owe it to yourself." [tentatively raising hand] I think I got the plot, I just didn't think there was very much of it. So much was just wandering back & forth in the the rainy dark. There are lots of recurring motifs, and some story bits that smack of tragedy, esp. the Pry Mincer’s explosive reunion with Granser, but there’s not much in the way of plot or plot twists. Which I really liked! Books written in such an unfamiliar dialect slow me down as a reader, in a really welcome way. I pretty much had to read the entire book aloud, under my breath, to catch a lot of the meaning. My eye can't identify cern* or tryl narrer or Pry Mincer, but my ear does. And slowing down and reading it all aloud (subvocalizing, anyway), was great fun for me. I got to smile at lots of puns and singsong bits I would otherwise have zipped right by. This slowing down & delight of recognition took the place of the complicated plots I often expect in SF and particularly a trope I expect in post-apocalyptic stories: the Big Reveal of the Old Thing, a la the Statue of Liberty in Planet of the Apes or [insert one billion spoilers here]. There weren't any such grand reveals in the plot, but a slow accumulation of little ones, mostly at the level of language: Salt 4 is sulfur, etc., etc. The reinvention of gunpowder and the (beautiful) scene in Cambridge Cathedral were great but not surprising. How are we doing this? Are we, today, discussing the book in toto, or are we going chapter by chapter? How long will this entry in FanFare remain open? Re-reading after having not for about 15 years--the language is still engrossing. I'm only three chapters in. I remember the Punch and Judy imagery having especially potent, multivalent effect, and then also the role of charcoal in this world. More, soon. I think this is it. Free form discussion of the whole book, thread open indefinitely for long-tail discussion. Go for it! One thing I've been thinking about Riddley is how it is such a product of 70s nuclear anxieties which certainly resonates with my own childhood fears. It's odd that culturally we don't still carry the weight of that threat, although all those nukes are still with us, aren't they? For me nuclear anxiety is completely replaced by climate change anxieties, but I still remember those fears. I wonder if people under 40, who didn't grow up with the Cold War, relate to this book? I wonder if people under 40, who didn't grow up with the Cold War, relate to this book? I can answer that, for myself at least. I'm 34 and from the UK, so the world of Riddley Walker is absolutely fascinating to me for a number of reasons. Being Scottish, I'm no stranger to fiction written in phonetic colloquial language, but I don't have the advantage here of knowing what Scots sounds like - this is a future language with a basis in a modern one. When I was reading this book I described it to my wife as being 'New Old English' - full of phonetics and idiosyncrasies of speech but essentially recognisable in a dozen different ways, once read aloud. As for the Cold War, I was just old enough to understand what was happening (to a degree) when the Wall fell. But the spectre of nuclear haunted me for years anyway, especially around the collapse of the Soviet Union, the coups and counter-coups and the prevailing 'what the hell happens now' feeling that came about when I was coming into awareness of geopolitics in my early teens. Plus my parents (and the local library) were 3-5 years behind the geopolitical times, so many of the books I read and films I watched treated the Cold War and nuclear apocalypse as an imminent fact, rather than something that had apparently just become recent history. I love apocalyptic fiction largely for the teasing out of clues and working out what the hell happened and how it is affecting the people still alive. I especially loved this book for that, because the gulf of time and language made the whole book, effectively, a giant riddle. The only other book I feel has come close to the same profound sense of change and time and apocalypse was Canticle for Leibowitz, although it did not have the additional fog of barely recognisable language. This is a book I want to read. I'm interested in both the plot and structure. Unfortunately, I can't read it, nor process it audio format. I've tried several times, but the only thing I gain from my efforts is a headache. A headache, a concrete example of how my flavor of dyslexia works, and disquieting insight into what struggling readers may experience. (Instead of the impatience I remember feeling, now, I find myself wondering why/how people read (or try to) - if words, letters&sounds have to be mapped like this). Ususally, I wouldn't comment on something I haven't read, however in this case, the language is deeply entertwined with the content, and worth appreciating. I just wish I didn't feel left out! One thing I've been thinking about Riddley is how it is such a product of 70s nuclear anxieties which certainly resonates with my own childhood fears. 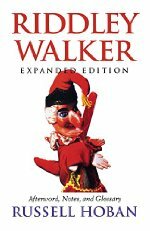 I reread Riddley Walker earlier this year, and it remains one of my favorite books. Unlike some other books of that time (say, Ecotopia) it has held up well to the passing of time and doesn't feel dated to me. The language is part of that, as is (as noted above) the careful containment to Riddley's perspective rather than a heavy handed didactic narrative voice. I first tried to read the book when I was about 12, and I completely stalled out within the first couple of pages. In retrospect, I simply didn't have the ability to process the language -- to read the words, turn them into sounds or find the visual connections, and create a fluid sense out of the book without slowing down or feeling frustrated. And when the book has come up in conversations, more people than not have said they found the language to be an impenetrable barrier. I can only imagine how dyslexia would make a novel like Riddley Walker difficult or impossible, since what it requires is so different from the vast majority of books. I just bought, but haven't yet started, Paul Kingsnorth's The Wake, which some reviews have compared to Riddley Walker in the language. Opening it to a random page, I can see why people make the comparison, but I don't think he is doing exactly the same thing. In retrospect, I simply didn't have the ability to process the language -- to read the words, turn them into sounds or find the visual connections, and create a fluid sense out of the book without slowing down or feeling frustrated. The use of language (semantics, not just spelling) is an impressive feat. These shifts really drive the imagery and world-building home. I felt immersed in the experience, and a profound sense of what was lost. I think that feeling of loss, which comes through the book, strengthens my loss at being unable (so far) to read it. I must confess that I can never remember very much about any book I've read from the moment I close it at the last page. It makes rereading a joy, and exams impossible. What I remember about reading Riddley Walker was constant amazement at the developments. What I remember about having read Riddley Walker was feeling like I'd joined an elite group who had communed with something awesome. I was young, mea culpa. A friend of mine, who is an art director for a children's book company and a long term full-out fan of Hoban was lucky enough to get to work with him at the end of his life, on Soonchild and a new edition of Jim's Lion (with illustrations by Alexis Deacon as astonishing as Hoban's prose). He had bought for me a copy of Hoban's classic children's book The Mouse and His Child, absolutely insisting I read it. But when anyone absolutely insists I do anything it tends not to happen. It's still waiting on my shelf for me, though. Few things are as patient as books. At his best, Hoban got the sheer music of language better than most writers I can think of - he's like the Ornette Coleman of prose to me: at his furthest out it can seem like chaos, but at the same time there's such a clear intention to what he's doing that one is emboldened to worry away at it. If you like Hoban's language jams, may I recommend Deadsy and Door, his collaborations with the animator David Anderson. So far I've only read two of his other novels for adults - his first: The Lion of Boaz-Jachin and Jachin-Boaz, and Linger Awhile, one of his last. Magic and fantasy are deep parts of both, and in a sense, Riddley is more "real", in that there is no magic. Likewise the Francis books (which I think are wonderful and display his playful inventiveness with language so well in Frances' little songs to herself) are more "real" than those adult novels I read, even if they happen to be about talking, dress-wearing animals. I'm curious why he stopped illustrating his kids books. I love his drawing style too.